Ready to Fiesta? 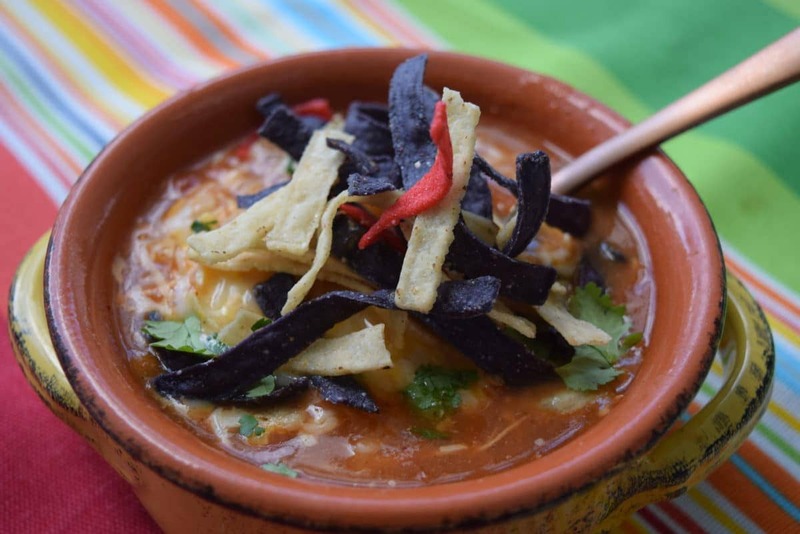 Start off your Cinco de Mayo celebration with this Chicken Tortilla Soup! The celebration can’t begin with out it!! And it’s ready in 30 minutes! OLÉ And do you see that cilantro! Well it is calling your name! 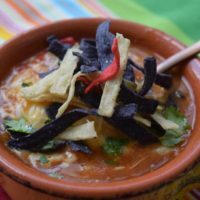 We have a Mexican restaurant in my hometown that makes this soup and when I made this the first time I though YES I finally know their recipe. Well not really their exact recipe, but wow does it sure taste like theirs! Do you see me smiling! Thank goodness I did not have to beg for their recipe! I must say I found a recipe on Pinterest a few years back and made a few changes to the original recipe. In order to get the amazing flavor the first thing you will want to do is make Crock Pot Salsa Verde Chicken. This chicken is the key to the soup! 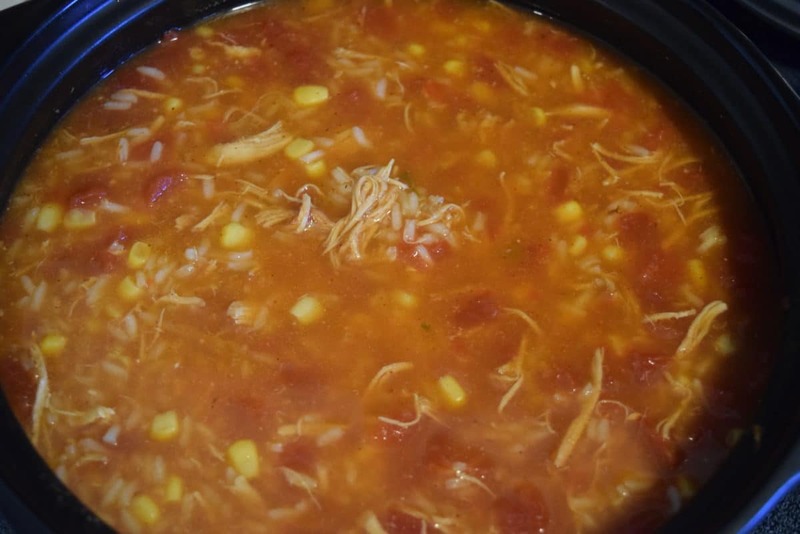 The recipe makes enough chicken for a meal, like perhaps Creamy Green Chile Chicken Enchiladas, and you will have enough left over to make this soup too! WIN two meals!! 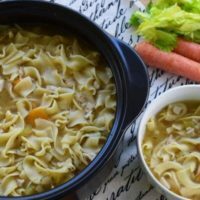 This soup is ready in 30 minutes – ANOTHER WIN!! 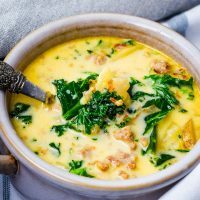 Yes and it is full of flavor and you don’t have to cook it all day! Now since the chicken does need a little time. Make it ahead of time or get it started in the morning! Shred your chicken and you are ready for an amazing soup! 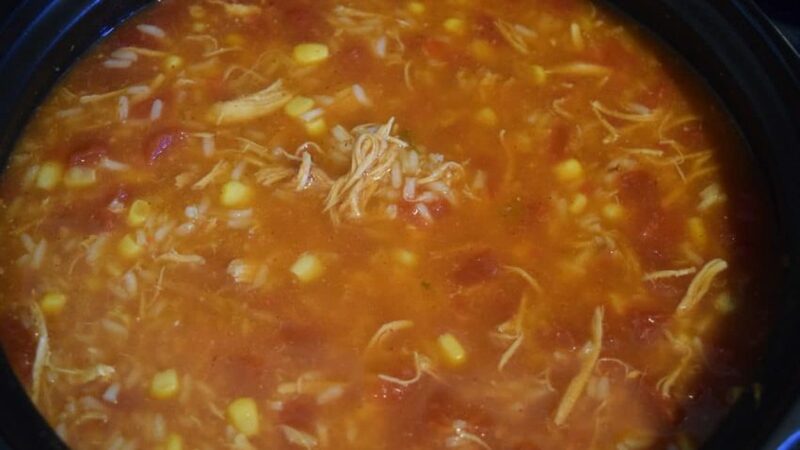 You need 64 ounces of chicken broth, 2 cups of shredded chicken, 1 can of diced tomatoes, 1 can of Rotel Original (diced tomatoes with green chili’s), 2 teaspoons garlic powder, 2 teaspoons chili powder, 2 tablespoons of tomato paste, 1 can of drained corn (or frozen corn works great too), 1 to 1 1/2 cup long grain white rice, juice of 1 lime, and cilantro to taste. All goes into a large pot, bring to a boil. Reduce to medium low and simmer for 30 minutes! Now hold on to your maracas because these Sunday Supper Taste makers have come up with Cinco de Mayo Recipes fit for any FIESTA!! In a pot add 2 cups shredded chicken, 64 oz of chicken broth, 1 can of diced tomatoes, 1 can of Rotel Original (diced tomatoes with green chili's), 2 teaspoons garlic powder, 2 teaspoons chili powder, 2 tablespoons of tomato paste, 1 can of drained corn (or frozen corn works great too), 1 to 1 1/2 cup long grain white rice, juice of 1 lime, and cilantro to taste. Bring to a boil, reduce to medium-low heat and cook for 30 minutes. Blueberry-Chocolate Jicamuffins by What Smells So Good? Mmm, one of my all-time favorite soups. Yours is so pretty with the blue and white corn strips on top. 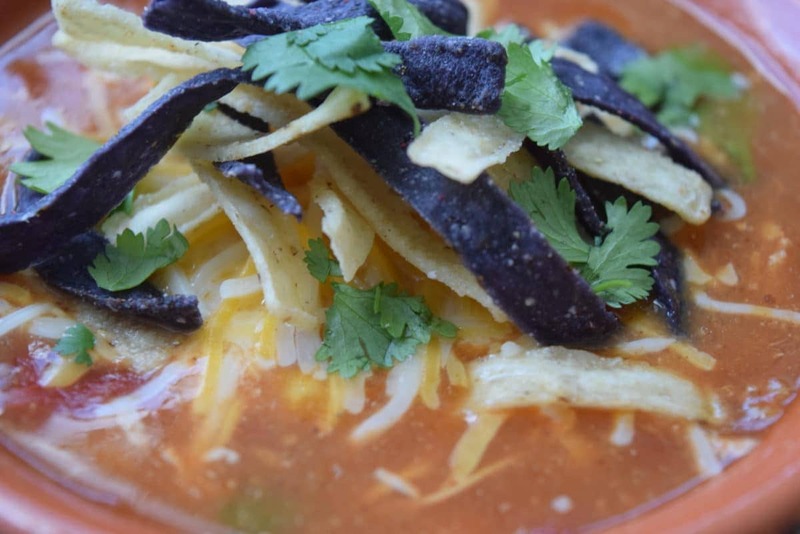 Bravo to replicating a restaurant fave, Nikki =) Love the cheery colors in your tortilla soup. Pinning! Great idea to jazz up the chicken that you add to your soup! So much depth of flavor, how could it NOT be amazing???? 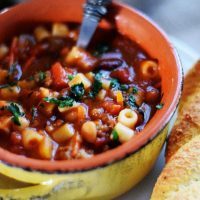 Hi Nikki, love everything about this soup, sounds like you have added so much flavor. Pinning for later. 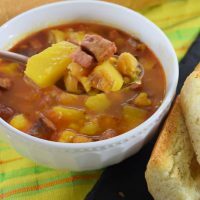 Wish I had this recipe this winter – what a great, hearty soup for cooler weather! 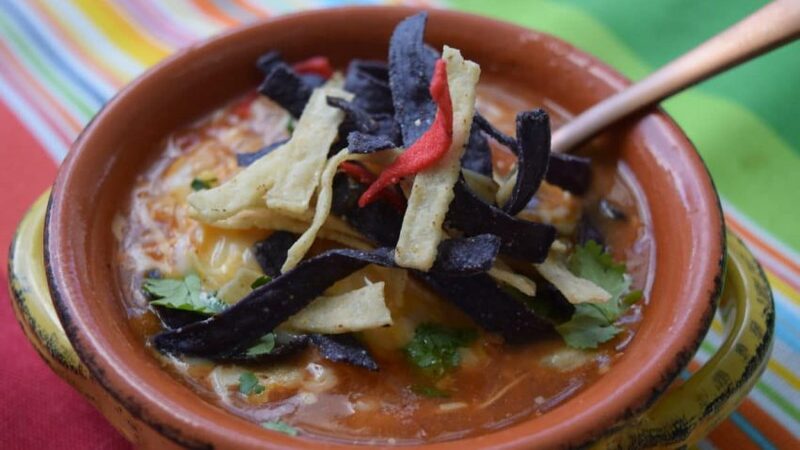 great looking tortilla soup, I definitely want to try this! 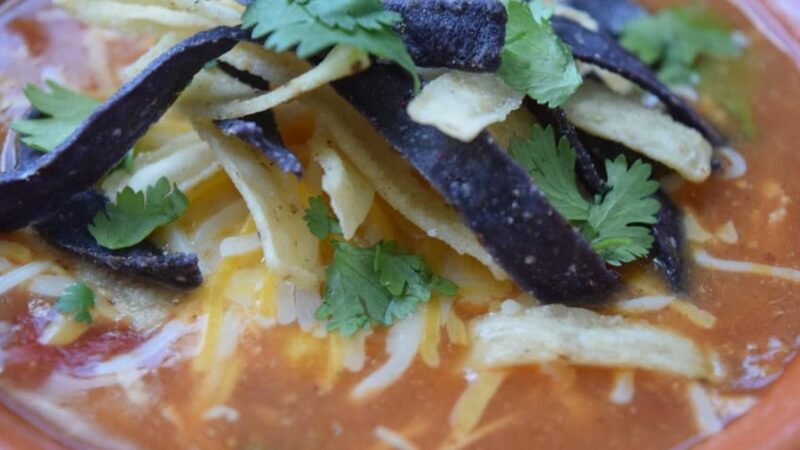 I love chicken tortilla soup and though everyone seems to make it differently it’s always delicious isn’t it? I can’t wait to try this…and you chicken verde too!